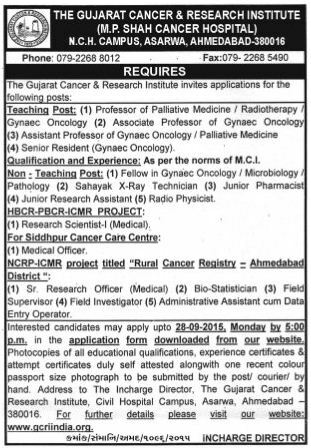 The Gujarat Cancer & Research Institute invites applications for various posts, interested candidates may apply upto 28-09-2015. Qualification: For More details must read full notification. How to apply for GCRIINDIA Recruitment: Interested candidates may apply upto 28-09-2015, during office hours, in the application form downloaded from our website. Photocopies of all educational qualifications, experience certificates & attempt certificates duly self attested alongwith one recent colour passport size photograph to be submitted by the post/ courier/ by hand. Address to The Incharge Director, The Gujarat Cancer & Research Institute, Civil Hospital Campus, Asarwa, Ahmedabad – 380016.